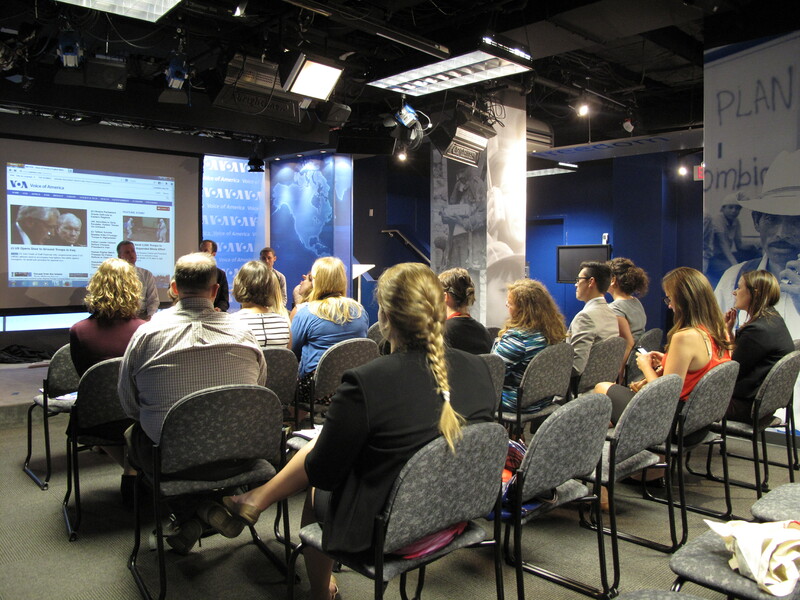 In 2013 Peace Corps held the first “Blog It Home” competition to reward volunteers for doing a great job promoting Peace Corps third goal through blogs and social media. The first year the organization chose four blogs that were nominated by their country directors. This year they continued the competition, but improved and learned from the previous year. In 2014 volunteers from all around the world were asked to submit their own blogs, rather than having country directors nominate one volunteer per country. 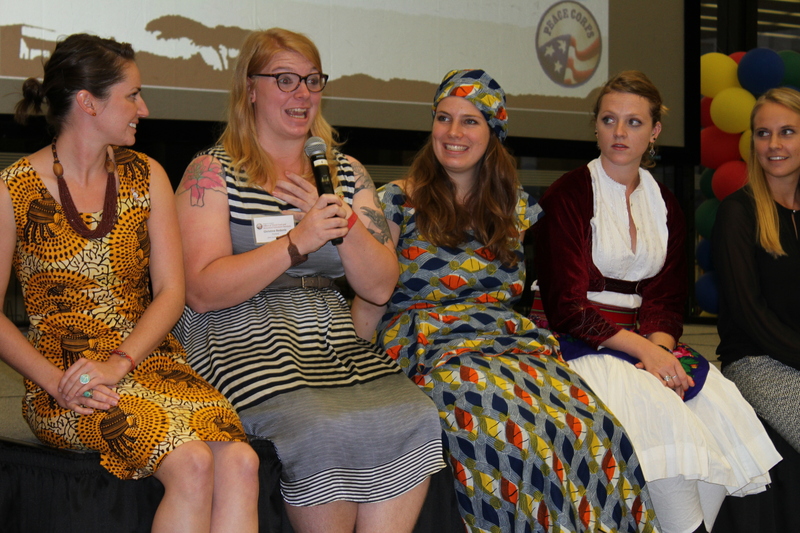 Over 350 blogs were submitted from the 65 countries that Peace Corps is currently serving in. Once the blogs were submitted they went through an intense vetting process by employees in the 3rd goal office in Peace Corps headquarters. They narrowed down the blogs to 90 in the first round and then down to 20 finalists. After the best 20 blogs were selected, Peace Corps turned it over to the public for a voting contest on Facebook. Whichever blogs received the most “likes” on Facebook helped decide the final winners. Many of you may have received annoying messages asking for your help to win the contest. After several (long and excruciating) days the voting was over and I felt like I had a pretty good chance. Then I received the congratulatory email. I was ecstatic! Nine volunteers from eight countries were chosen to represent Peace Corps in the Top Bloggers Tour in D.C. All of the other bloggers are amazing and you should definitely check them out: Keith and Heather in China, Bronwen in the Dominican Republic, Anna in Cameroon, Sara in Guinea, Erika in Senegal, Christine in Thailand, and Julia in Uganda. 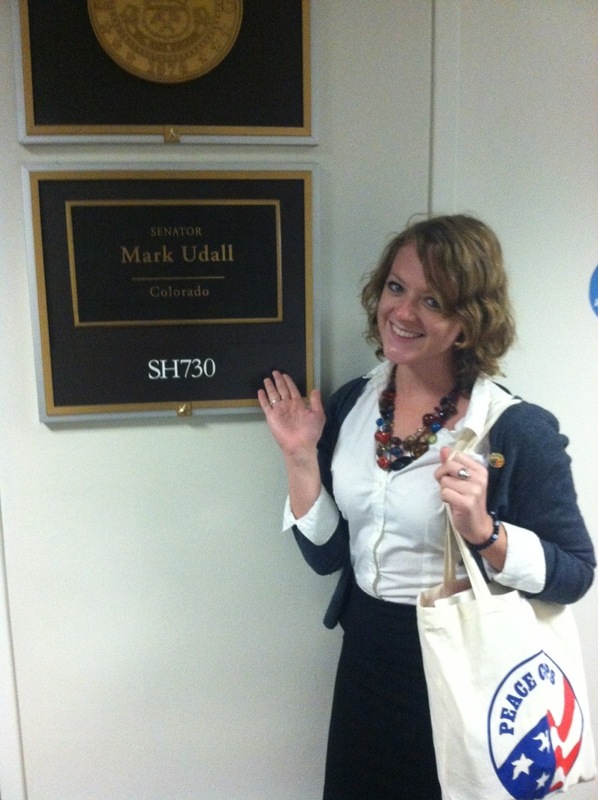 Now I didn’t mention earlier, but the prize for winning this contest was an all-expense trip to our nation’s capital to help promote goal three, our Peace Corps country of service, and to have the opportunity to network with some of the best and brightest in Washington D.C. 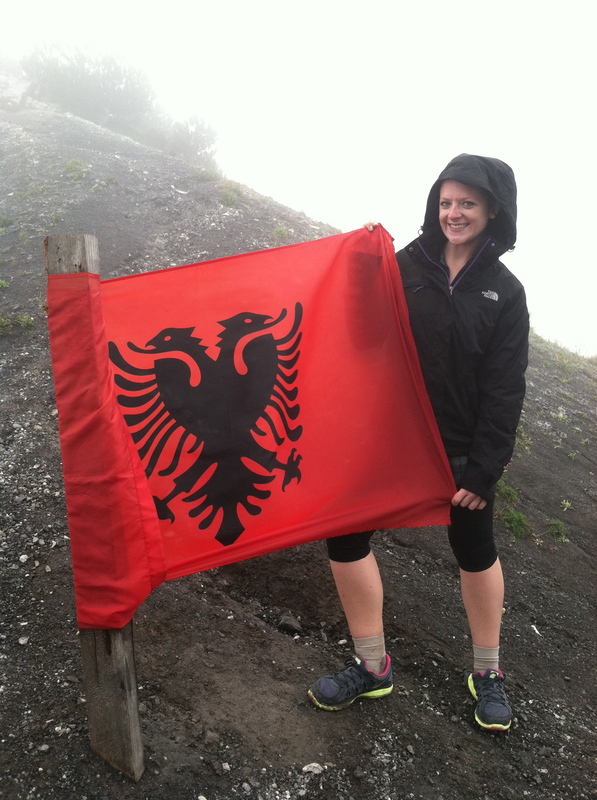 I was so excited to be able to share some of the wonderful things that I have learned about Albania this past year and a half. Plus burritos. Chipotle was definitely my first stop back in the states #noshame. 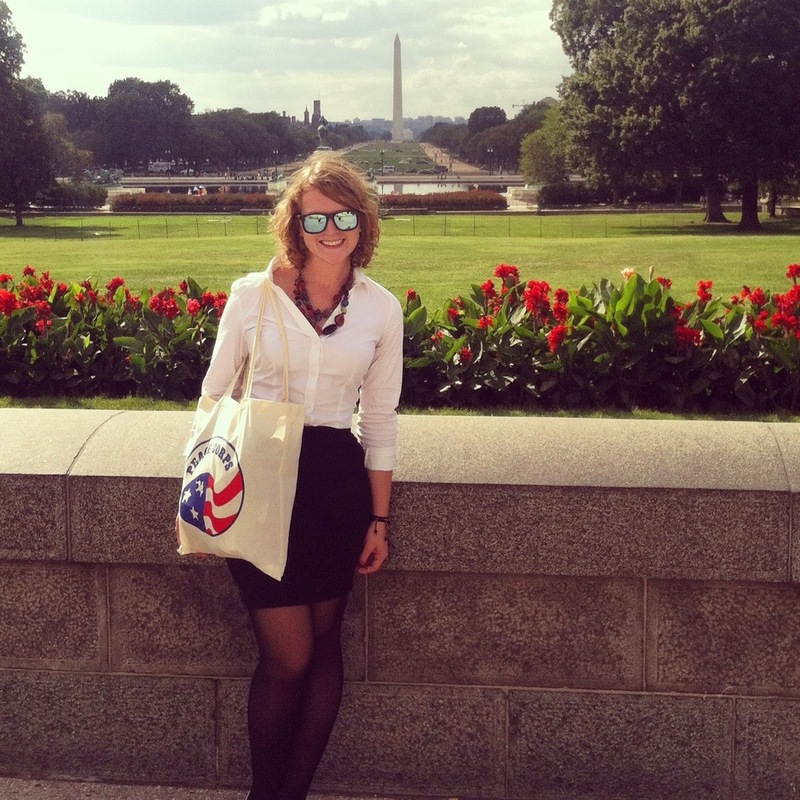 The week was a whirlwind of activities, professional development, and Peace Corps promotion. I arrived on Monday afternoon after 15+ hours of travel from Albania and immediately met my roommate, a volunteer serving in Thailand. It was really interesting to chat with a volunteer from another country because we were able to connect and relate on many different levels, despite the fact that we serve in communities with very different cultures. We ate burritos (did I mention that I LOVE burritos) and then I passed out at a completely unreasonable time, damn jetlag! The next morning we started bright and early at the Peace Corps headquarters. I met the other winners and the staff that helped bring us all the way back to America. When we arrived the room was FULL of snacks – peppermint patties, cookies, chips, candy, etc, etc. WOW! It was overwhelming. I wanted to eat it all, but sadly my stomach did not agree with that sentiment. We received information about the week ahead, had time to develop the final touches of our presentations, toured the Peace Corps office, and ate delicious food trucks. 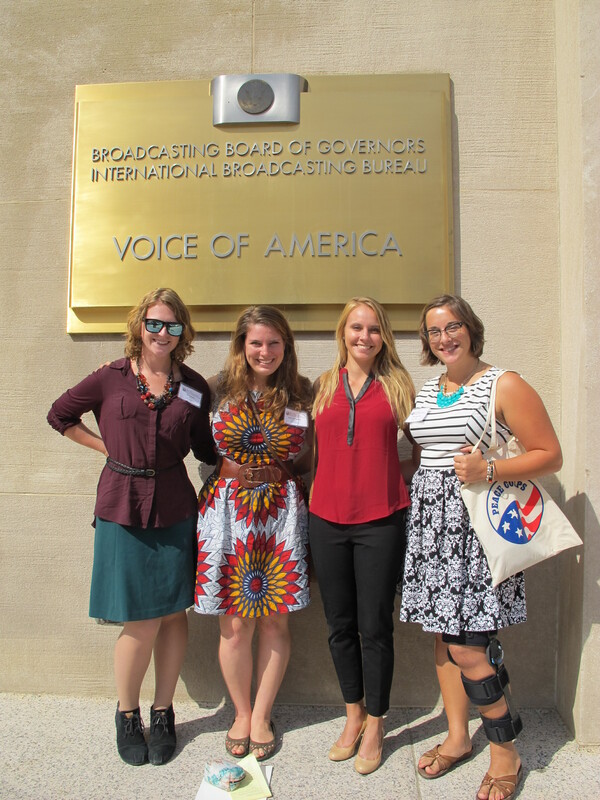 In the afternoon we toured Voice of America, which is an american radio/television broadcast that serves many communities across the globe. Voice of America is actually pretty popular in Albania (I had no idea) and is shown on the national news on Channel 24. Much to my surprise, Voice of America Albania wanted to interview me for the program. Immediately I was nervous and a bit apprehensive about how much I could really explain in Shqip, but I mustered up my courage and did the entire interview in Shqip. I probably sound like a 3-year old, but hey, at least I tried! Check out all those snacks. 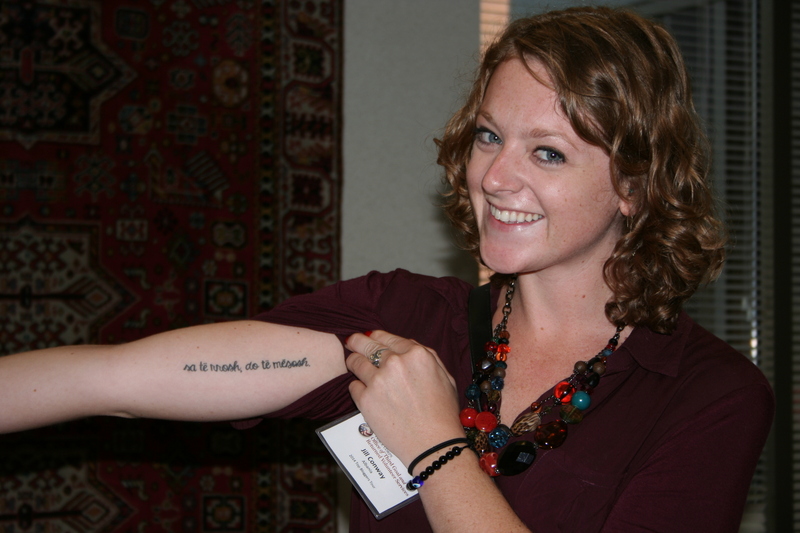 Showing off my Peace Corps tattoo. 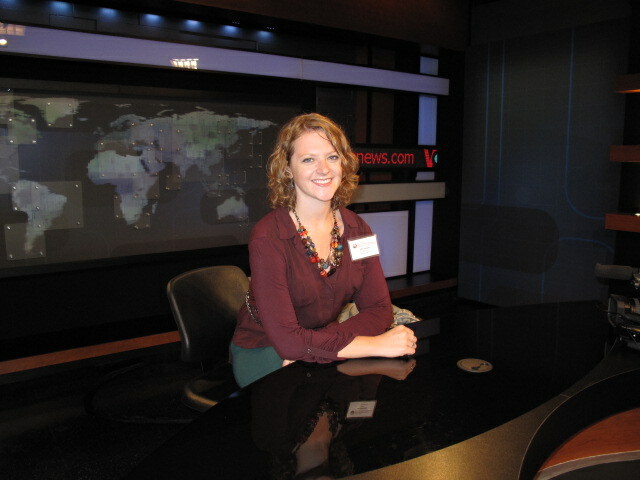 I was interviewed on a real set! On Wednesday we were all off to the White House to meet with two representatives working with White House social media and other pertinent projects. The first person we spoke with was actually a returned Peace Corps volunteer (Washington D.C. has the highest population of returned Peace Corps volunteers in the country) with an amazing story following his service. He stayed in his host country and actually developed a sustainable phone company with members of his community. Now the business is run by the host country nationals who helped develop the company from the ground up. Truly an amazing Peace Corps success story. 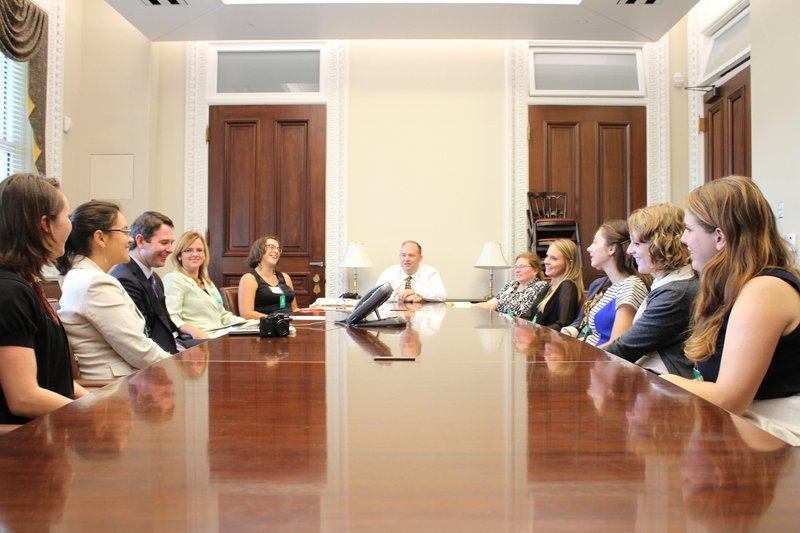 After that I met with senior staff members of both my senators from Colorado. I explained my story and talked with them a little bit about Peace Corps. Currently Peace Corps is not receiving much funding in comparison to many other government programs, so it’s important to try and give a face and real-life story on why we should continue to fund these sorts of programs. If you would like to see Peace Corps receive more funding from Washington please sign the petition here to help our budget increase. In the evening we were back to work with a group presentation at the Martin Luther King library followed by an hour of break-out sessions at individual tables. I borrowed some supplies from other wonderful volunteers in Albania and was able to have a pretty impressive display. I wore a traditional costume from the Miredite region and had several dolls to show some of the traditional dress from other areas of the country. I also brought maps, mountain tea, wedding decorations, postcards and personal pictures, and of course the wonderful flag. I spoke with all different sorts of people, some of them were also interested in possibly joining the Peace Corps. During the evening I even taught a mini valle (circle dancing) lesson. I am not the best at valle admittedly, but I definitely worked it. Our first White House meeting. 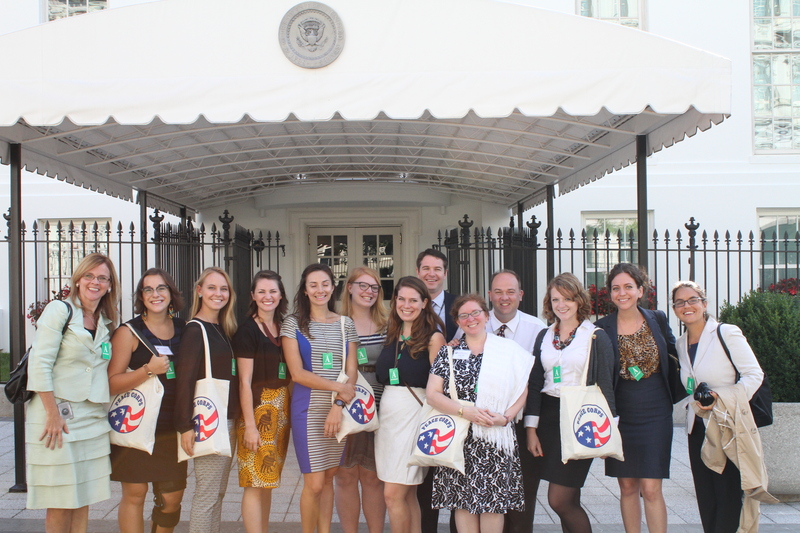 Group shot outside the west wing. 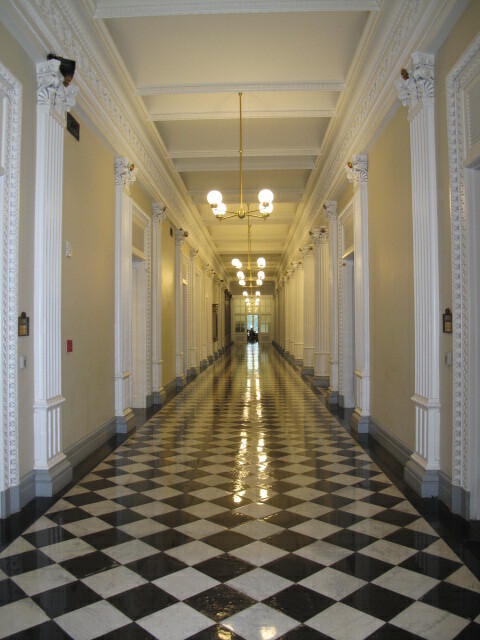 It’s pretty cool inside the White House. 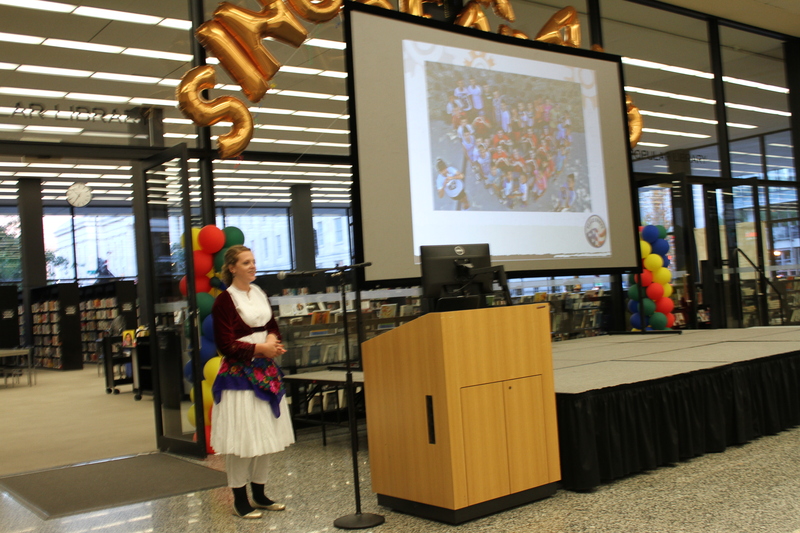 Giving a presentation at the MLK library event. 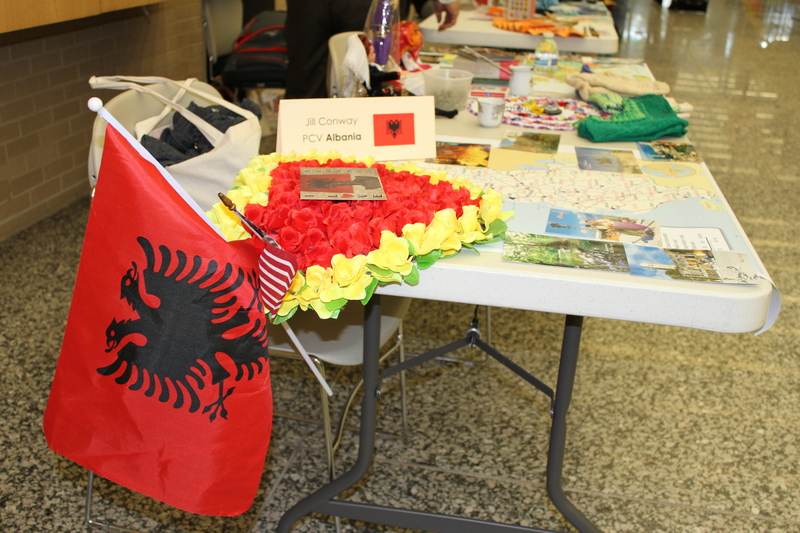 My table full of fun stuff from Albania. Talking about Peace Corps and Albania with some of the participants. 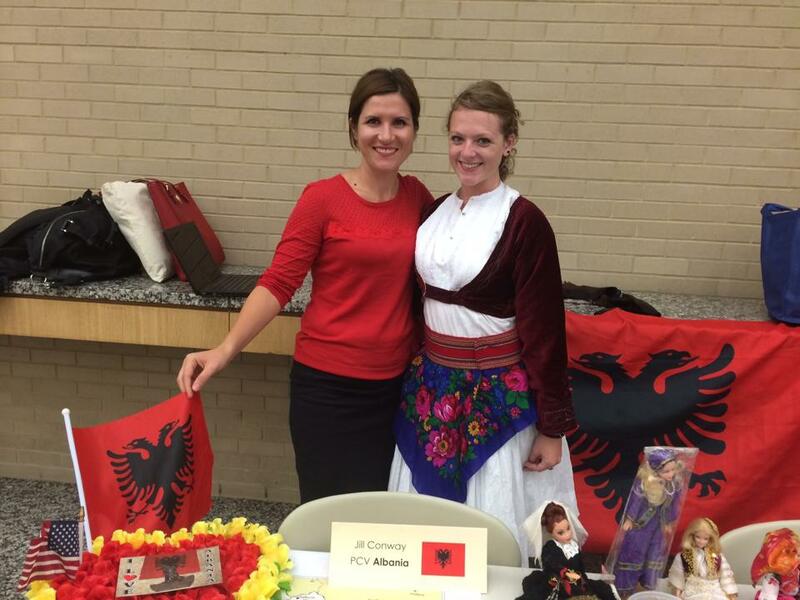 A former Peace Corps Albania staff member even came to support me! 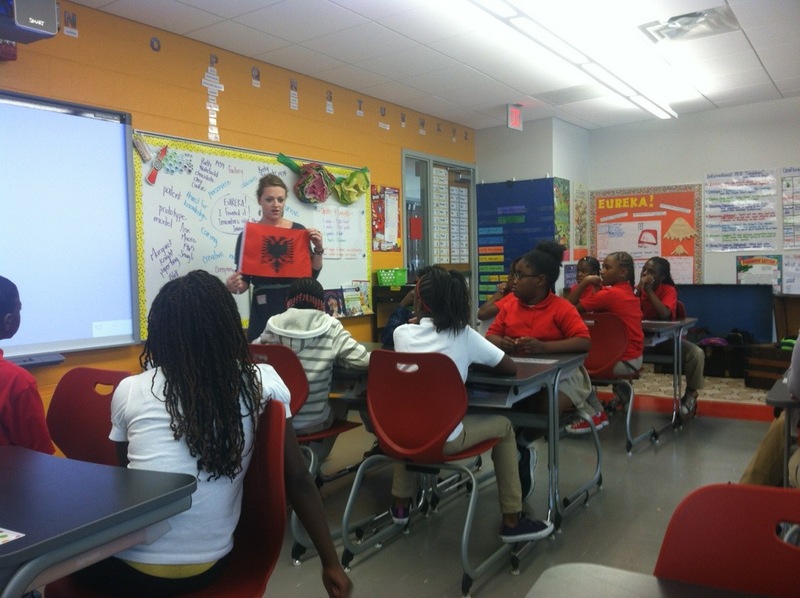 The next day was my favorite day of the week because we gave presentations at local inner-city schools. I gave presentations at Jefferson Academy Middle School and at Hendley Elementary School. It was so great to be back in the classroom setting. In total I gave 8 individual classroom presentations to over 150 youth. It was amazing to be back in my element. After the school visits we had another presentation for the youth in the evening. 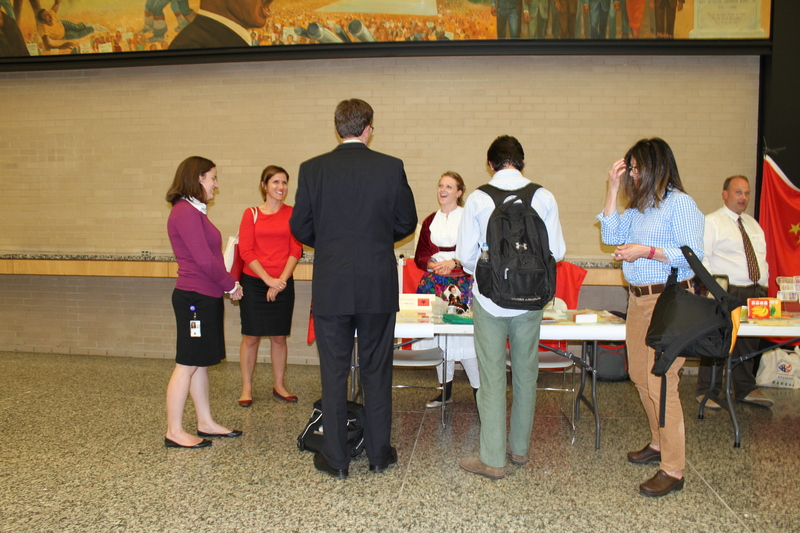 Peace Corps hosted an event for the Girl Scouts in D.C. Hundreds of girl scouts came to the event to hear all our stories. This format was similar to the event at the MLK Library the night before. During this event I focused more of some of the amazing gender development work that volunteers in Albania are working on right now, especially the GLOW “Girls Leading Our World” program which was piloted in several cities across the country earlier this year. It was a really special event and when discussing with the other volunteers we could really feel the positive energy from the girls. Who knows, we could be the reason some of those girls chose to join the Peace Corps in the future. I know I was definitely inspired when I heard from a returned volunteer while I was in high school. Giving a presentation at the elementary school. 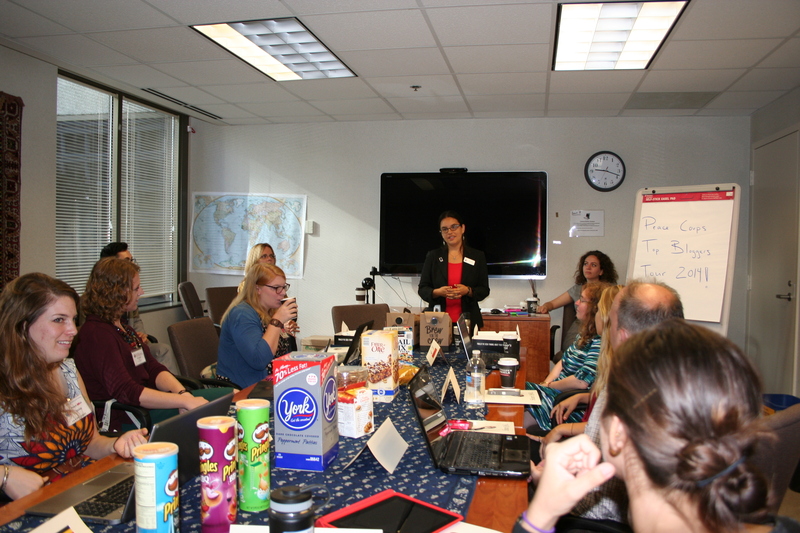 The last day we gave a presentation to Peace Corps headquarters about our favorite blog post and how blogging has helped us develop as volunteers and as professionals in today’s world. I spoke of the random viral success that my blog received and how that changed the way I blogged from that point on. 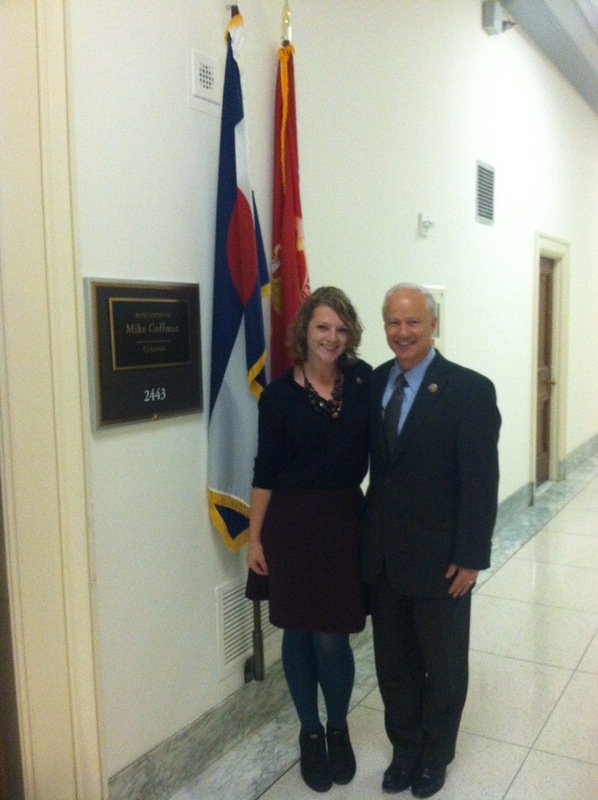 I also met the congressman Mike Coffman from my district in Colorado. We ended the week in typical American fashion with happy hour at this hole-in-the-wall bar next to headquarters. It was such an amazing and special week for me. It is still hard to believe it actually happened because it all went by so quickly. I can’t wait to take this new energy into the next eight months of my service. Thanks Peace Corps and thanks to all my avid followers! This wouldn’t have been possible without your help. As you can see, Peace Corps kept us busy, busy, busy. I have been walking around Washington D.C. the past few days at the pace of a snail. This is quite different in comparison to everyone else rushing around from work to the subway. I stare at everyday ordinary things in awe with a completely new perspective on what it means to shop at a Walgreens or walk on a sidewalk. 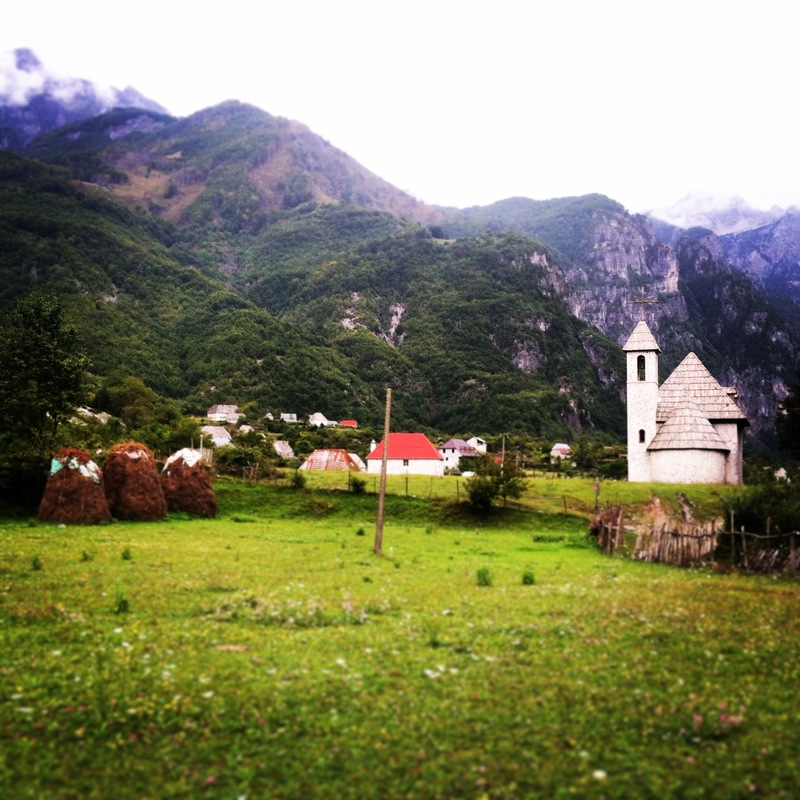 In Albania, we xhiro and take our time getting from place to place. We are never in a rush and being late is usually just part of the program. Here the hustle and bustle is apparent and, honestly, somewhat overwhelming at first. Everyone is on their way to something important or in a hurry to get somewhere else. Personally, I have grown to love taking my time to go slow. Avash avash. I also feel a bit slower because I am confused on how many things work here. It’s amazing how quickly technology changes and all the different rules there are in America. Going through building security has been super confusing for me, especially at the White House. Simple things felt like they were taking me twice as long to complete. I now feel like I have a little taste of what it would feel like immigrating to the United States from another country, although that would, of course, be much more difficult. There are so many different choices to make in America: what kind of deodorant you’d like to buy, which food truck you want to hit up for a quick lunch, where to have happy hour (I honestly forgot happy hour even existed), if you want chicken or beef on your burrito, etc, etc. Consumerism is a strange concept to me now, especially consumerism on such a mass level. If you think it’s difficult to make decisions amongst volunteers in host country about what the plans should be, imagine adding in 50 bijillion more options. Making a decision can be tricky process. But seriously, even making my own choices has been overwhelming, thus exacerbating the whole “moving slow” thing. My Shqip is at the level of a small child, at best, but I still like to throw Shqiplish (a unique mix of Albanian and English) into everyday conversation. Common phrases that I would use while speaking to my Albanian friends and other volunteers does not make sense to people that don’t understand a lick of the language. Ska problem or e kuptoj do not have relevance to most people that I interact with here. It’s led to several interactions with people that are, most definitely, somewhat confusing. Immediately after getting off the 9.5 hour flight from Vienna to D.C. I was quickly reminded in how much Americans value personal space. Airport security crammed everyone from my flight into a tiny moving room to transport us all to another section of the airport. The room was very crowded, but security kept yelling and insisting that people move towards the back of the area. We could not pass on either side though because of strollers and other obstacles in the pathway. As I was standing in this incredibly crowded room an older women turned to me and said, “Miss, you can not be putting your backpack into our space like that.” My backpack invaded this woman’s personal bubble and, since she is American, she would make sure that I knew this was not okay. I quickly apologized and tried to maneuver myself out her vicinity so that my backpack would not hinder her experience any further. Another example of personal space happened while some of the other winners and I were out to lunch. We decided to stop at the food trucks near the Peace Corps office and then eat in a courtyard area nearby. All the tables were full, so we sat down on some stairs near some other girls. Not even a minute after we were seated the girls turned to each other and said, “Ugh, come on! Let’s move.” They moved across the courtyard and glared at us for taking their glorious lunch spot on the stairs. Whoops. Things in America are expensive, especially in our nation’s capital. 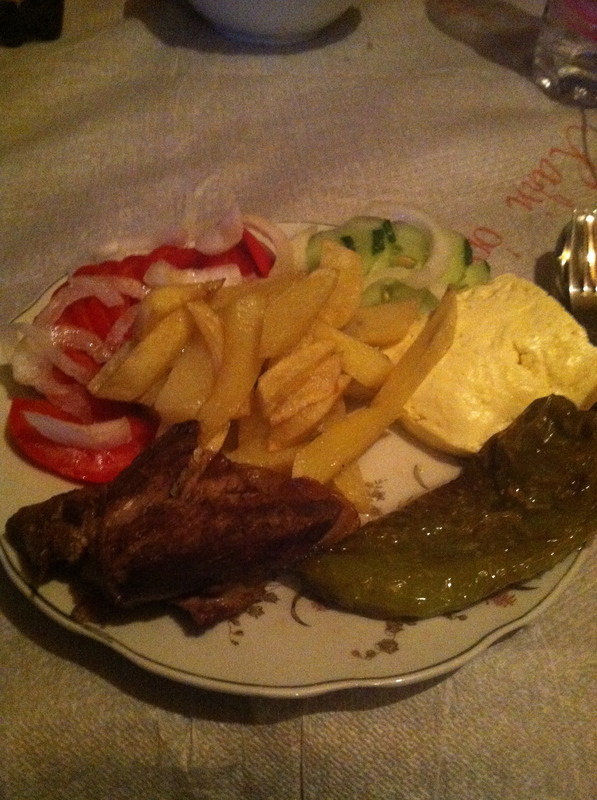 In Albania I can get a great traditional meal for under 300 lek ($3). The same amount of money in America could maybe buy me a coffee, if I’m not drinking anything fancy, but even that is questionable. Pretty much every meal (including fast-food) is at least ten dollars, if not more. I still have am having a hard time paying five dollars for a drink during Happy Hour. What is that?! I could buy 10 shots of raki, or perhaps an entire bottle, for that kind of money. I am not used to hearing people speak English ALL AROUND ME. It’s interesting to notice how often I tune out during my daily life in Albania. If I was constantly listening to everyone around me in Shqip I would have a never-ending headache. This is mostly because I am not fluent in the language, so I would be translating a lot in my head still. Being able to understand everything that is going on has been pretty exciting, but kind of distracting as well. I can’t help myself sometimes, but I am just so fascinated in listening to the kind of things that people are talking about here. I spent a lot of time before my trip fantasizing about all the amazing food that I was going to eat back in the states. Burritos, sushi, fast-food, you name it – I wanted that in my belly. After being back for less than a few days I was already sick of eating all the high calorie gi-normous meals. Plus my stomach has not been too happy adjusting to the change in time zones and the change in diet. Where is the fasule at? Or the pilaf and sauce kosi? It’s funny because I have any sort of cuisine at the tip of my fingers, but really all I want is some rice from the friendly hole-in-the-wall restaurant right next to my work. Since serving in the Peace Corps I have become used to spending a lot of time by myself. I go into work daily, but the workdays aren’t quite as long as the traditional 9-5 career that most people have in America. I have a lot of time in the afternoon to lesson plan, research, read, and do whatever I want. Having so much time was extremely daunting at first, especially since I sometimes have a hard time with managing time wisely (aka I like to spend hours surfing through various social media newsfeeds). I have really grown to love all of my downtime because I have found that I need time alone to recharge and to reflect. I enjoyed the jam-packed whirlwind of a week with Peace Corps, but it was also exhausting constantly being on the go without much time to relax alone. 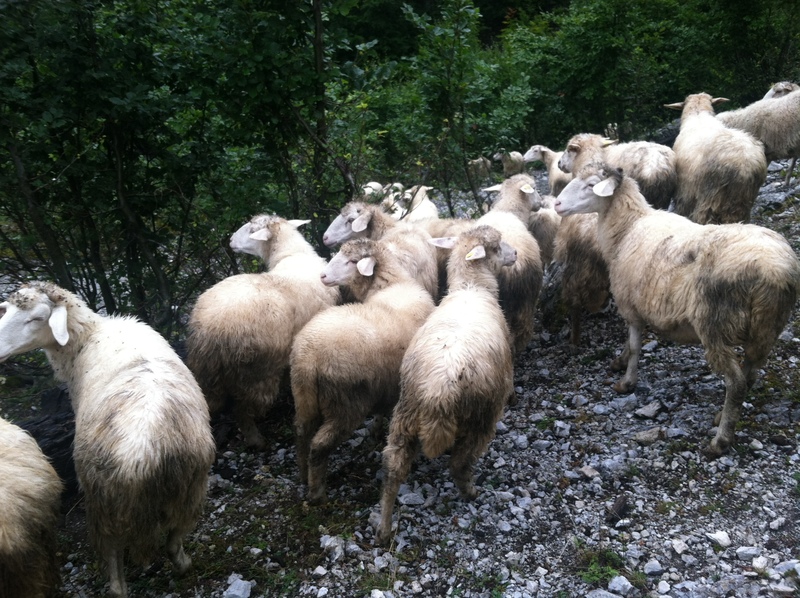 Albanians integrate many different body movements into their regular conversations. Being immersed in the culture, I have also begun to have similar body movements and quirks during conversations. I think I am also used to using my hands and body to communicate because that is the easiest way to get my point across during confusing conversations. I find myself pantomiming stories about my day, shaking my finger back and forth to answer “no”, the opposite head-nod, and trying to wave down taxis in a similar manner to a furgon. The opposite head-nod and finger-wag are probably the most apparent during my conversations with Americans because people think that I disagree with their statements when I am shaking my head no, but really meaning yes. 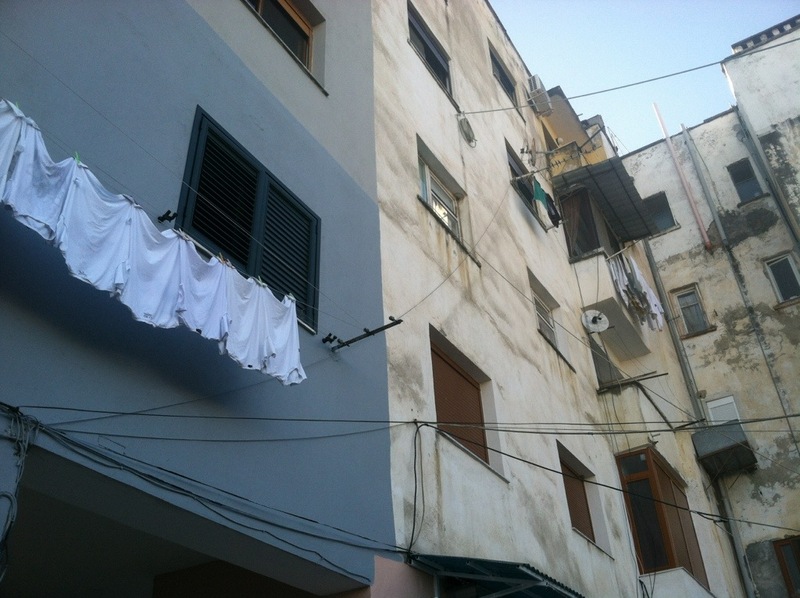 It is puzzling for those who don’t have that same experience abroad in Albania! When I return back to America for good I will probably be pretty annoying the first couple months because I want to talk about Albania. And I want to talk about Albania and my service A LOT. 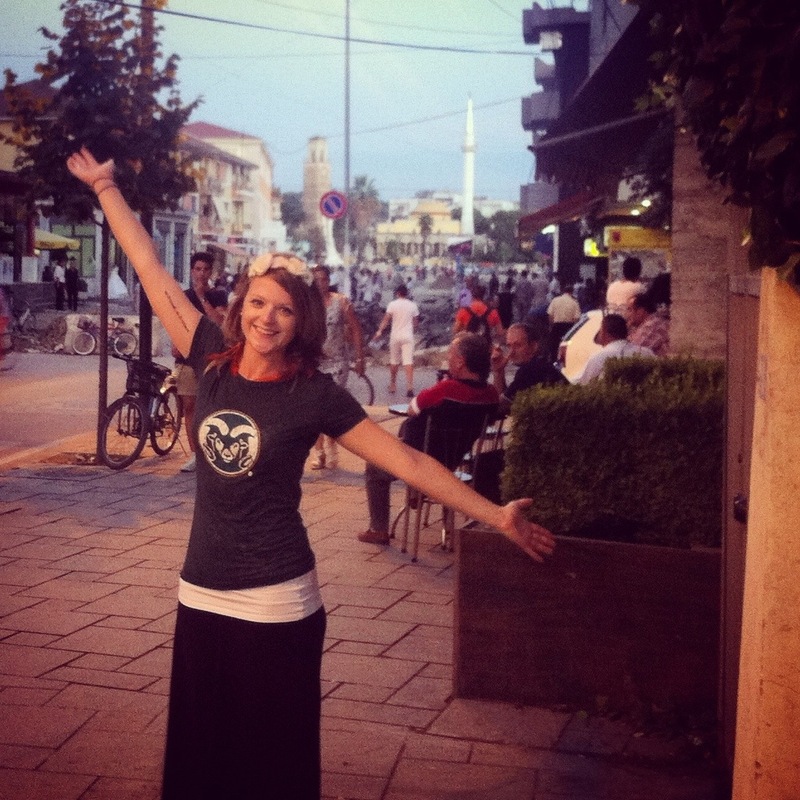 Peace Corps Albania has been my life for the past year and a half, so most things that I have to say are related back in some way to my service. Peace Corps is not a normal job because I am “working” 24/7 and I’m always “on” in my community. Someone could say completely random and I would probably have a way to relate it back to Albania in some form. I think this is common for returned Peace Corps volunteers across the board. Once I come back to America for good, I am going to be an interesting American, but definitely a more well-rounded American as well. I have loved spending this time back in the States, but I miss my community and can’t wait to get back to Albania with this new sense of appreciation for both my homes – Albania AND America. From now on, I will always be gjysma-shqiptare (half Albanian). Hanging out near the National Mall in between visits with members of Senate on the hill. I am a native Coloradoan—born and raised. I spent my entire life before Peace Corps living and growing up in the beautiful state of Colorado, so naturally I have an affinity for all things regarding nature. 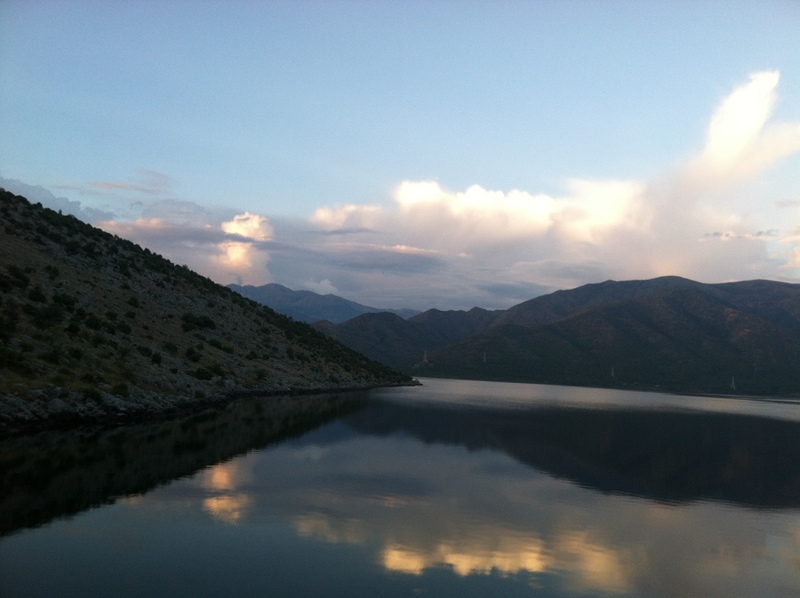 Luckily, I am serving in Albania, which is an gorgeous country. 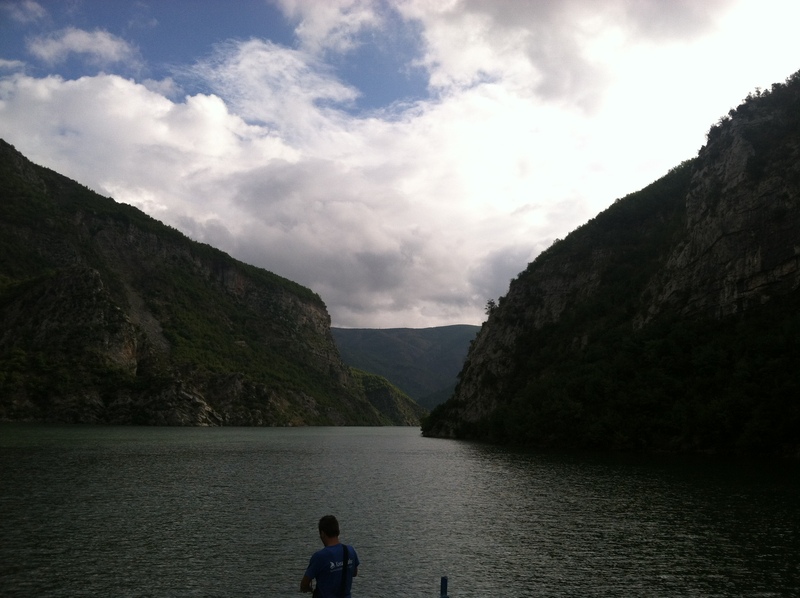 Albania has it all. 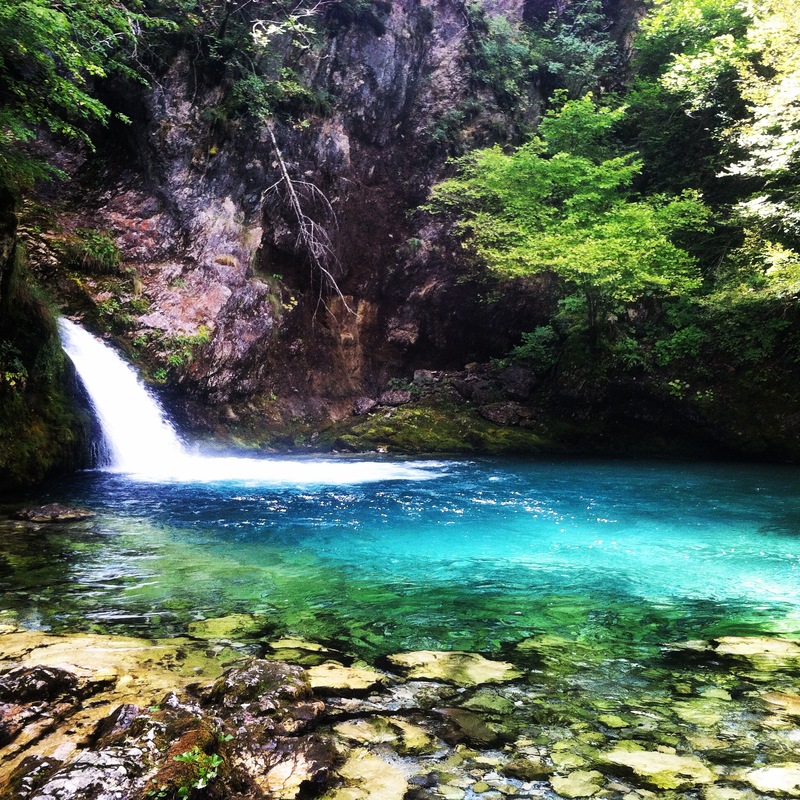 Down in the south there are beautiful beaches which contend against some of the well renowned beaches in Greece, Italy, and Croatia and up in the north there are the majestic Albanian alps—also know as the “accursed” mountains. I will always be a mountain girl at heart, so traveling up north to hike these mountains intrigued me. 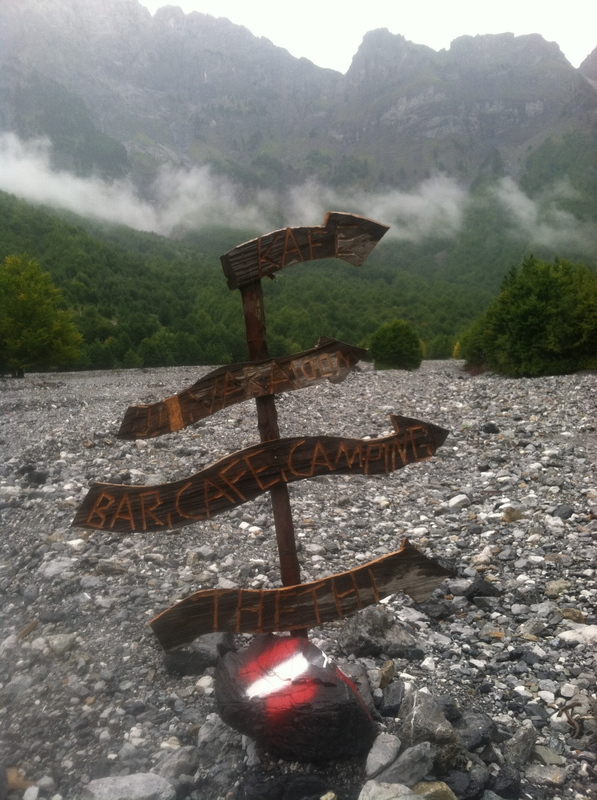 This summer I was finally able to plan a weekend off to make the long journey to some of the most northern villages in Albania to hike the infamous Valbona/Thethi pass. 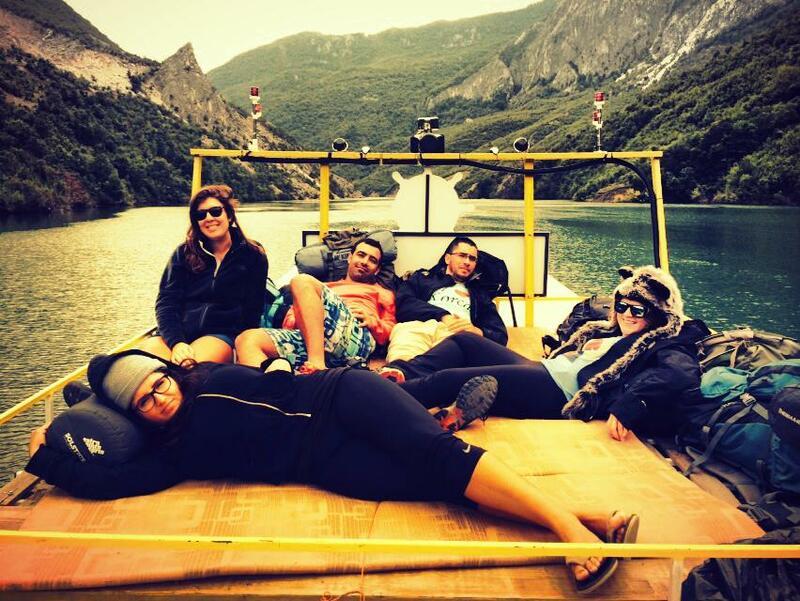 Several other Peace Corps volunteers, our Albanian friend, and I set out early morning on Friday from Vau Dejes to take the ferry from Fierzë to Komani on Komani Lake. 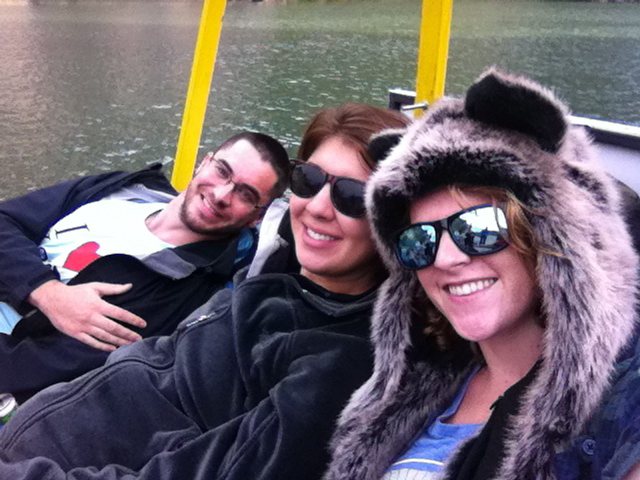 We all piled onto the ferry and sat on the roof of the boat. Throughout the three hour trip we took in the amazing views, caught up on each others lives, and began contemplating where we all will be in a year after our Close of Service (COS) conference. The boat ride, along with a private car ride from Vau Dejes cost us 850 lek (around $8.50). We were able to get some nice deals during our trip because the volunteer living up north has integrated and met many local connections in the area. Lake Vau Dejes the evening before our journey. Heading out to the ferry. The view from the ferry on Komani Lake. Hanging around on the top of the ferry. 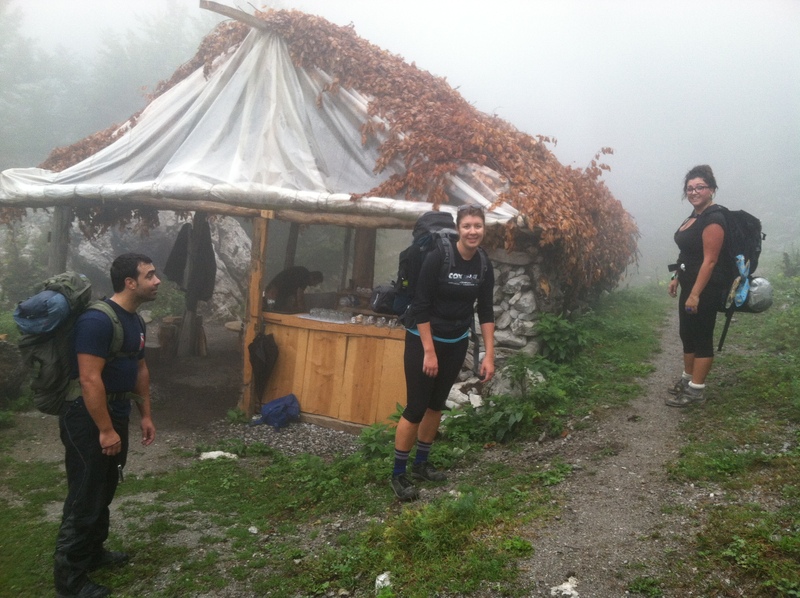 After finishing the boat ride, we all headed up to Bajram Curri for a quick bite to eat and to pick up another volunteer that wanted to make the trek with us. Once we finished, the furgon took us and some other tourists into Valbona and dropped us off to begin the next part of our journey. It began raining pretty heavily after we got out of the vehicle, but luckily I came prepared with a rain jacket and umbrella. 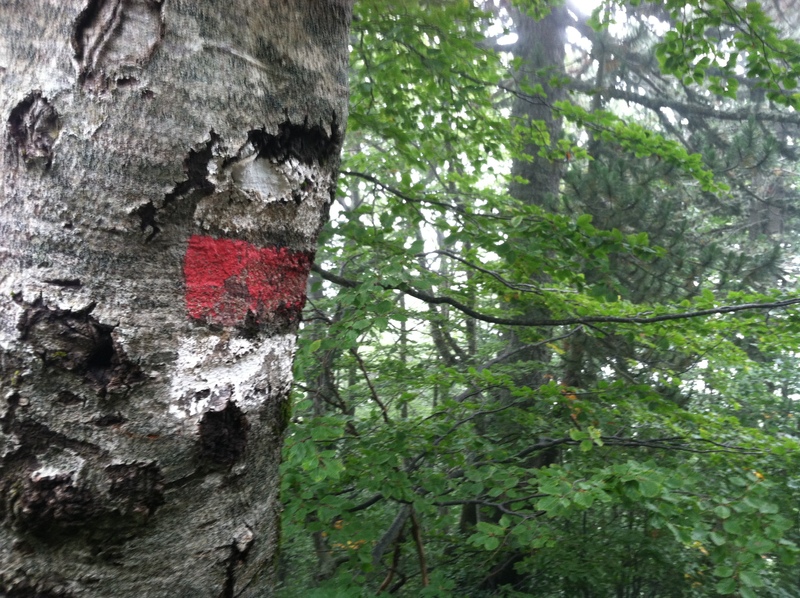 The beginning of the trail is not marked well, but several of the volunteers had made the trip before and knew where to go. After walking for about an hour we made it to our first stop at a families’ home at the base of the mountain in a small village just outside of Valbona. 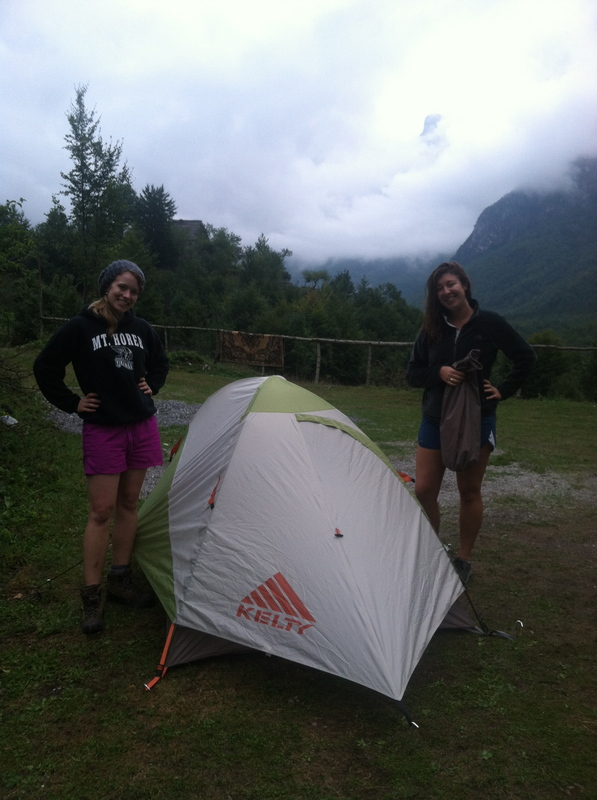 We stopped there and pitched our tents for the night. The family had renovated part of their land as an area for backpackers to camp for the same fee of 500 lek ($5) per tent. 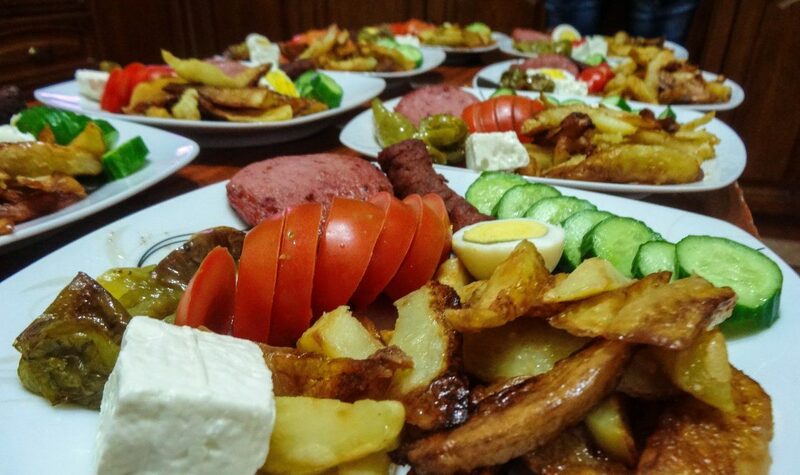 They also offered beverages and home-cooked Albanian traditional cuisine. We were all pretty chilly from the wet walk over and ordered çaj mali, which is a herbal mountain tea that is popular and sold all over Albania. This particular çaj was, hands down, the BEST tea I have ever tasted. The rest of the evening we spent playing card games, messing around with the children of the house, and cooking hotdogs over the fire. The family was extremely hospitable, as per usual, and the man of the house helped us build a fire and even chopped down some trees on his property for us to use on the spot. Another volunteer and I ended the evening reading each other ghost stories from Creepy Pasta. 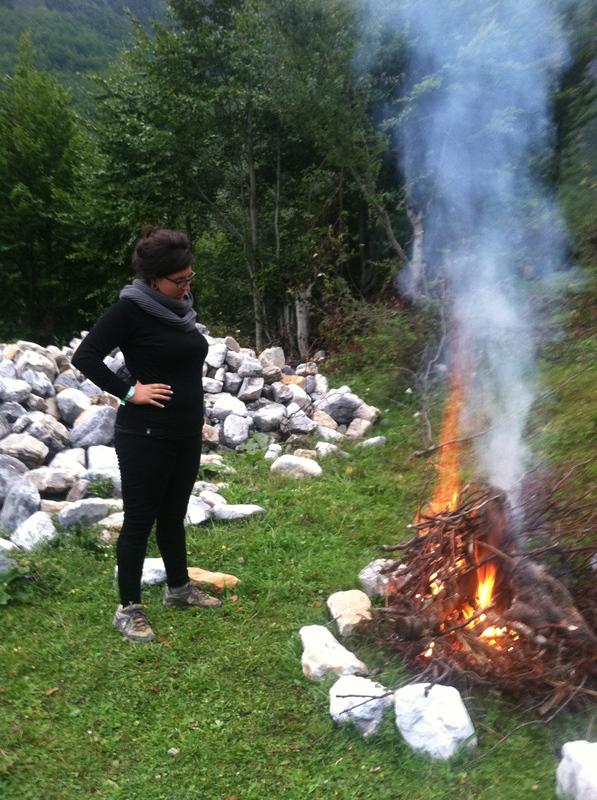 Starting the fire for our dinner night one. The first house we camped at. 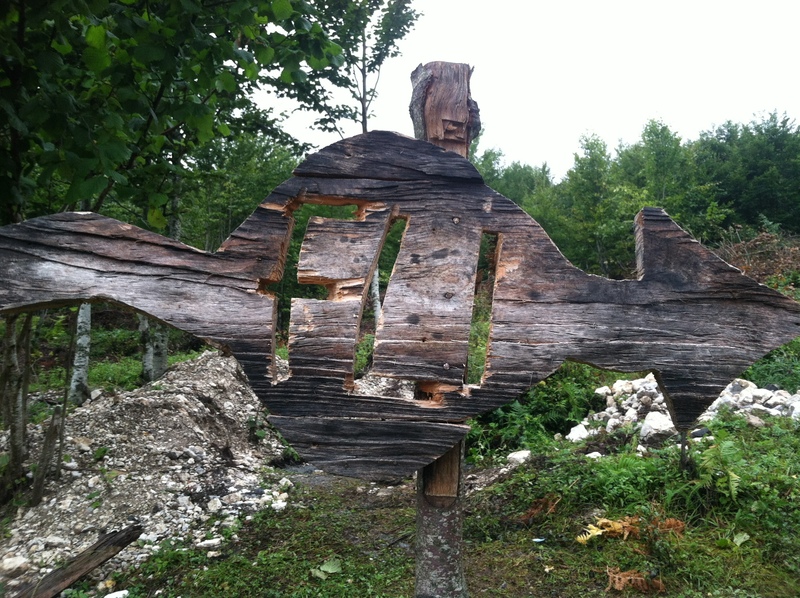 Fli is a traditional food in northern Albania. The next morning we got on the trail at 9:30am. 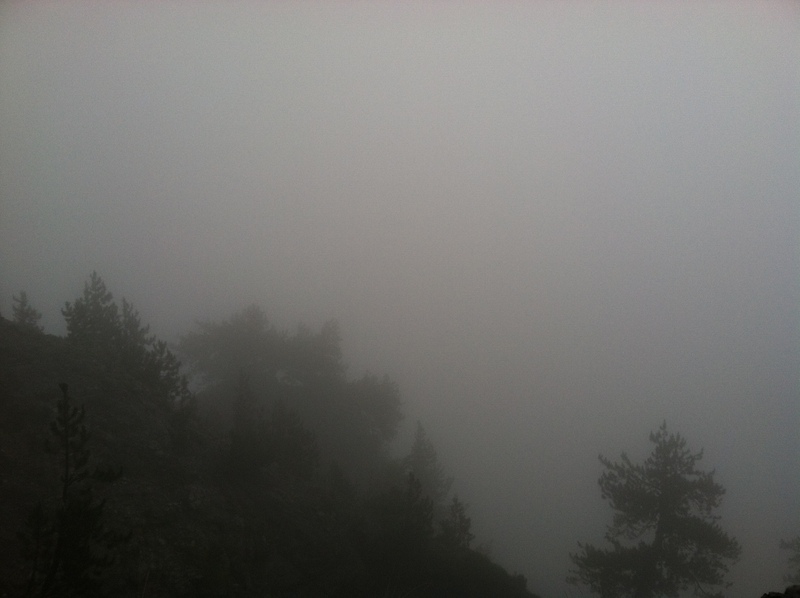 It was a very misty morning outside of Valbona and we were unsure if we’d even be able to have much of a view during our hike at all. 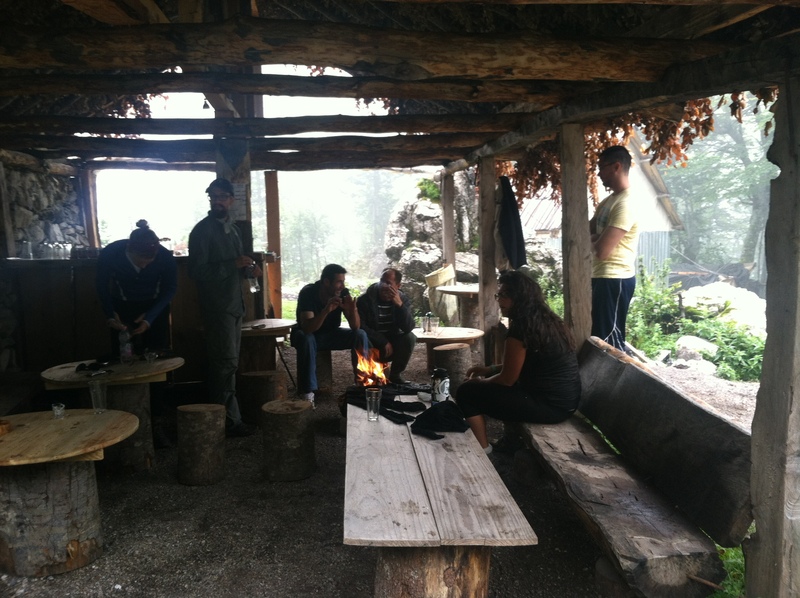 We continued for several hours in the mist and finally came upon a café on the side of the mountain with a nice fire ready to be enjoyed. Since we were wet, tired, and a bit out of shape, we took the opportunity to sit down and take a break with some more delicious çaj. 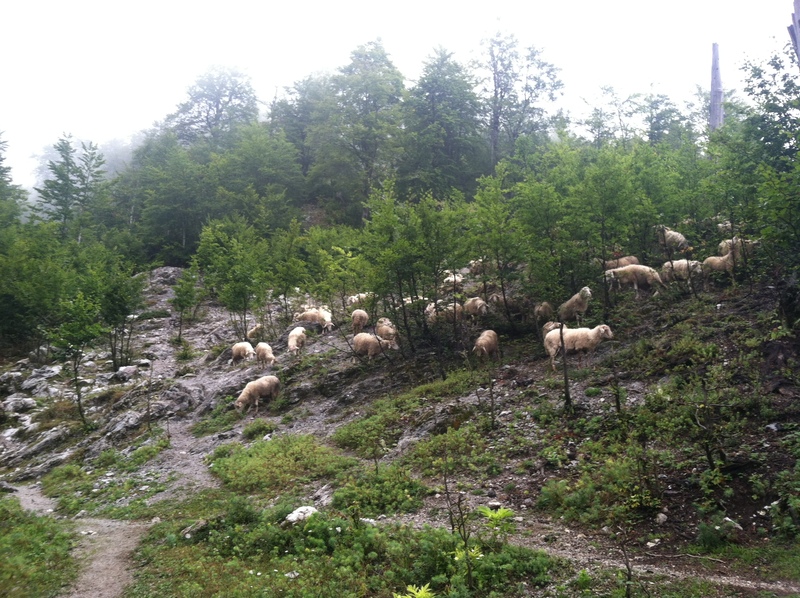 At the café we talked with the owner, who spoke fluent English, and another man who was herding sheep nearby. We filled our water bottles at the stream next door and continued on our way up the mountain. We finally reached the top around 1:30pm, but sadly we unable to see the amazing views we had heard so much about because it was overcast and drizzling. At the summit it was particularly cold, so we continued back down the mountain to have lunch at a café on the other side of the pass. On the way down, the weather began to clear up and we saw some of the views that we missed on the other side of the peak. 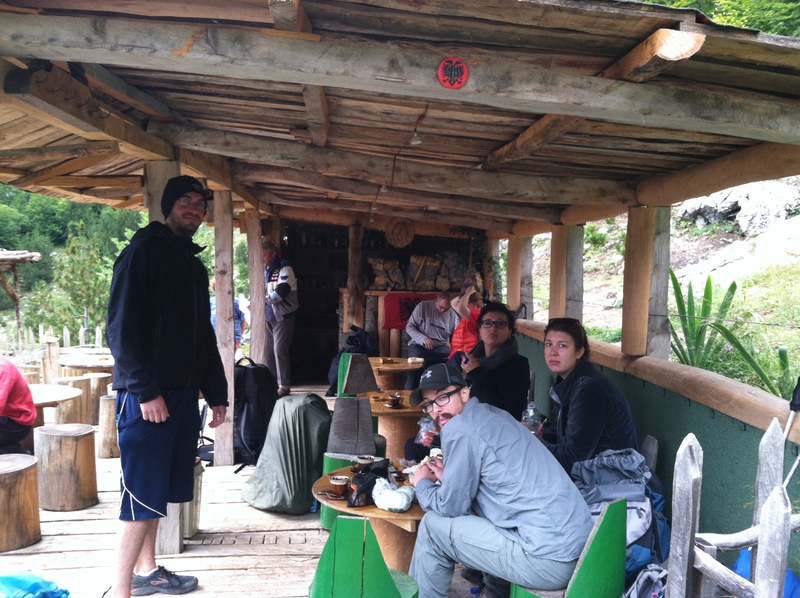 During our trip we took a lot of breaks and went at a slow pace. This hike is definitely not for the faint of heart. Towards the base of the mountain in Theth we found wild blackberries and ate them right off the bushes. They were absolutely delicious. 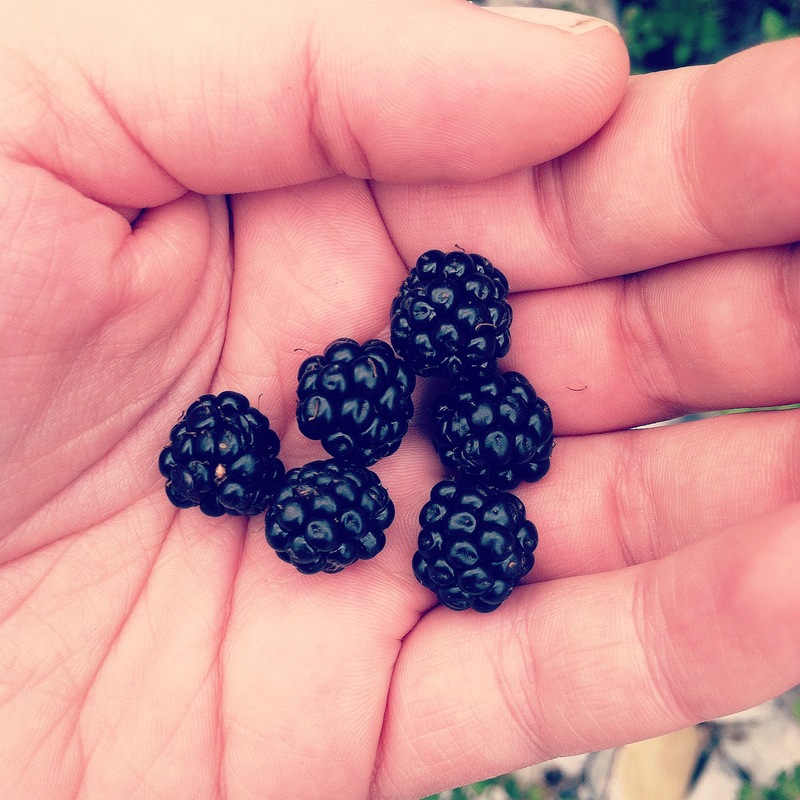 I had not tasted a blackberry since leaving the states, so I was extra excited. It reminded me of picking raspberries in my Aunt’s neighbors’ backyard when I was a child. Once we reached Thethi, we went to a local home that has been renovated into a small guesthouse and café to pitch our tents for the evening. The family let us camp in their garden for free and made us a home-cooked meal. It was so nice to have a real meal after a strenuous day of hiking. The man of the house offered us all raki and the entire family was extremely hospitable and friendly—no surprise there. Albanians are some of the best people in the world. That evening I had a chat with the nice man before bed and he complimented me on my Shqip skills, which made me very happy because I am a bit rusty at the moment. Outside our first stop on the way up the mountain. Warming up next to fire with some more caj mali. About halfway up the mountain to the summit. One of the markers along the trail. Our lunch stop on the way down the mountain. The view from our campsite in Thethi. Home cooked Albanian meal after the hike. The next morning we went on another short 3-hour hike to the northern blue eye. It was a beautiful morning and the sun was shining, which was a nice contrast to the previous day. 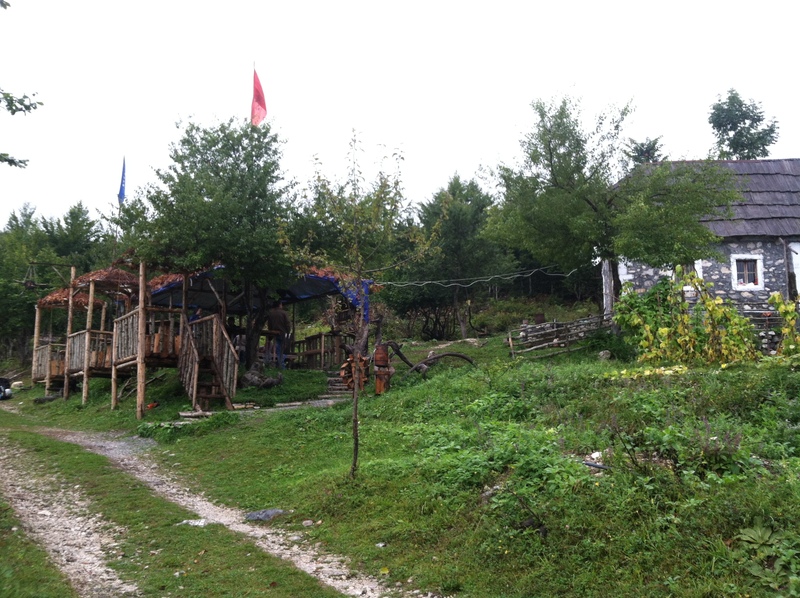 Once we reached the blue eye, we sat down for another çaj break in a tree house café. On our way back towards Thethi it began raining, but a nice local man drove us back into town for a reduced price. It pays to know the local language! 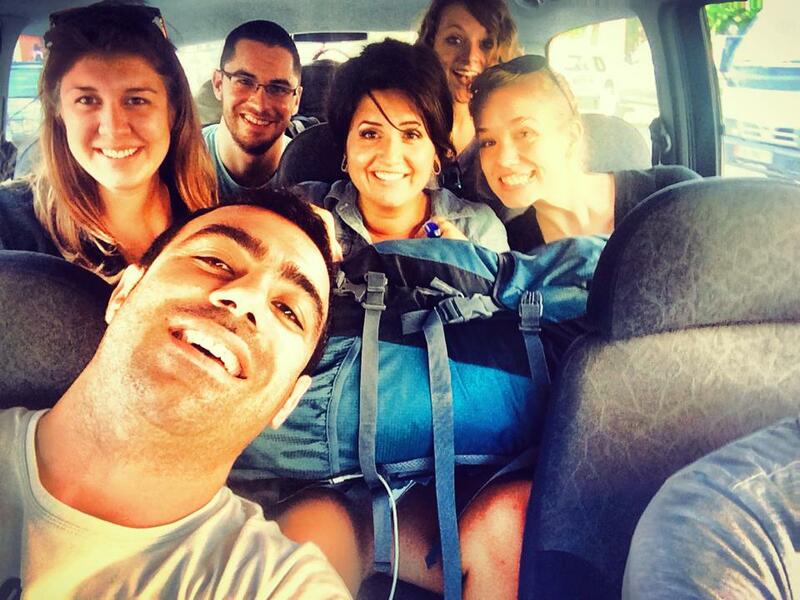 After that the owner of the guesthouse drove us back to Shkoder and we all went our separate ways back to our sites. It was a great experience finally hiking the accursed mountains and it definitely brought out the Colorado girl in me again. Everyday there is some new treasure just waiting in my own backyard here. I am so grateful for this beautiful place. Relaxing at the blue eye with one of the owners of the cafe. 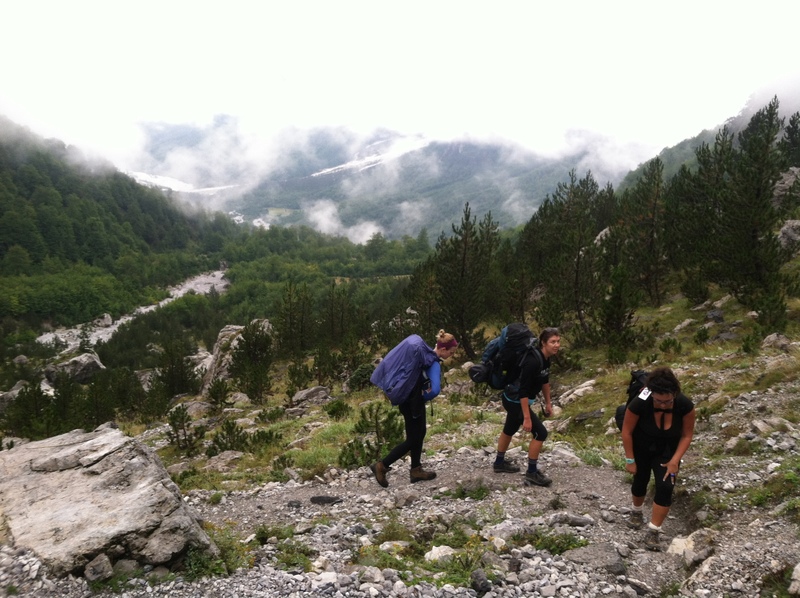 I would recommend the Thethi-Valbona hike for anyone with a sense of adventure. The trail and local roads have been improved over the past several years, from what I hear, and it is absolutely stunning. There are opportunities to go with a guide or if you don’t mind roughing it you can try it on your own. You may not meet a lot of locals that speak the language, but miming always seems to do the trick. Overall the trip is inexpensive, unless you are on a volunteer budget like me (aka pak leke). Go to the accursed Alps! Explore, drink raki and çaj, eat homemade meals with an Albanian family, and meet some of the friendliest people in the Balkans. Like I mentioned businesses are constantly coming and going in this country. My daily walk to the Directory of Public Health (DShP) is about 10-15 minutes depending on how fast I decide to xhiro that day. One day a business will be a consignment shop, the next day it will be a dentist, and overnight it will change again into some other random business. There is a very high turnover rate for new businesses in this country. Recently the municipality in my town closed all the businesses that were operating without a permit. Instead of just closing these buildings the city literally demolished these establishments. 37 buildings were completely torn down. In my opinion this seemed a bit drastic. I was confused why they didn’t just seize the building and sell it out to another business through the proper channels, but hey, I guess it made a statement. When the socialist party took over control of the government last fall many changes were implemented in workplaces across the country. 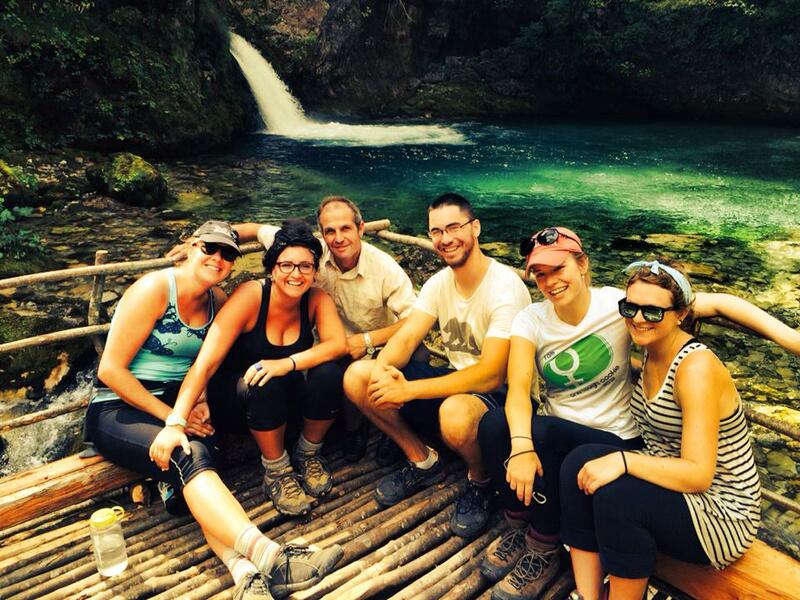 Most Peace Corps Albania volunteers are placed in the high school, the directory of public health or a health center, or the town hall municipality. We have English education volunteers, health education volunteers, and community development volunteers. All three sectors experienced changes in the workplace. This definitely caused some chaos and uncertainty during my group’s first year of service because many of our coworkers were unsure if they’d have their jobs in a month. Almost all of the director positions were reappointed with someone from the socialist party and many people lost their jobs. Often times the workplace titles were just switched around a bit too. The old director of the high school went back to being a normal teacher and another one of the former teachers was promoted up. At my workplace we received a new director who previously lived abroad in Canada and seems very open-minded. I was pretty happy when this change occurred because I never talked with the old director much. Our new head honcho enjoys practicing English with me over the occasional coffee and refers to me as his “other daughter”. Very sweet. Albanians overwhelming are extremely kind and hospitable people. When the director changed, my main counterpart became the head of family medicine and now no longer works for the health promotion unit, but she is still located within the same office. In the fall we are still going to try to reapply for the cervical cancer project even though her position inside the directory has changed. Now another doctor has been assigned to my unit, but I hardly ever see her in the office. 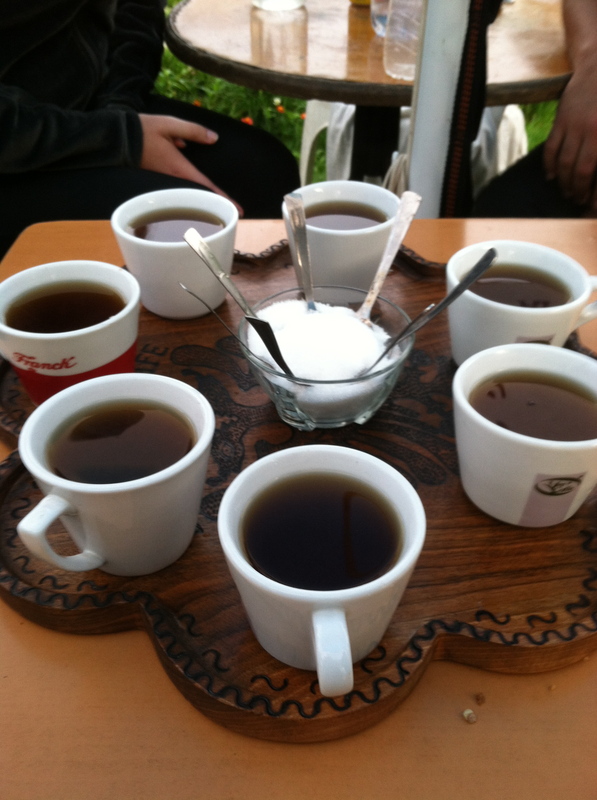 It is quite common for people in my office to show up for a few hours in the morning for a Turkish coffee with the coworkers, then they may head off to a school to do a health promotion lesson or just go and do household errands instead. I’ve been working with people in the office to be more accountable for their actions during the workday. Another change in my personal work situation is that another volunteer was recently placed in the town hall municipality. He has spent the entire summer integrating into the community and making connections with all sorts of people. He is going to be an essential partner and contact for my secondary project this year. I would like to open the first youth center in my site for students, Peace Corps volunteers, and their Albanian counterparts to use for extra-curricular activities such as Outdoor Ambassadors, GLOW: Girls Leading Our World, yoga, book club, Model UN, American Culture Watch club, and more! Having a reliable place to hold meetings will make it easier to begin more successful youth development projects for my community and Peace Corps volunteers in the future. Plus, the new ministry of education is pushing for more after school activities, which are basically non-existent right now unless a Peace Corps volunteer is running some in the community. The problem is finding the motivated teachers to devote extra time after school when they are not getting paid. And honestly sometimes finding motivated students can also be difficult. Many of the schools do not have running water or working restrooms, heat or air conditioning, and sometimes even electricity. The students and staff are also not provided lunch. By the end of the school day everyone is exhausted and wants to get home for one reason or another. Hopefully the youth center will allow us to have more flexibility in meeting times and dates to find times that work better for everyone. Things are changing. Roads are being re-paved and re-painted with traffic lines and parking spaces. I was beyond excited for the first paved parking lot with proper spaces that was made in our city over the summer. Why? Not totally sure. But it’s progress, and progress (no matter how insignificant it may seem) is a step forward in the right direction. Guard rails on the highway are being put in to help make the roadways more safe. 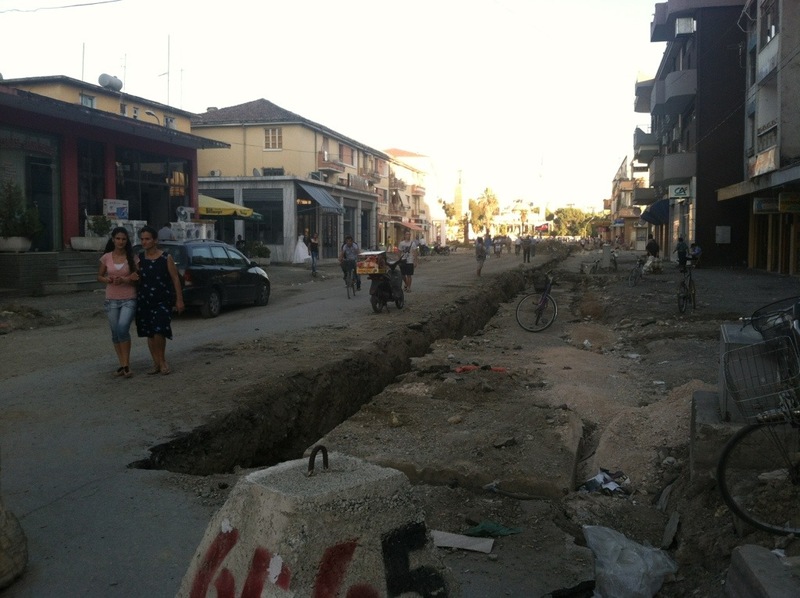 And finally the entire center of my city (and many other cities in Albania) is being completely remodeled. The whole center of my city has been torn apart. First the trees were removed, then the sidewalks, then the roads and all the buildings. The city has a beautiful plan to make a nice xhiro area with a fountain in the center. The project is projected to be down within the next year or two. I really hope that it will be close to finished before my Close of Service (COS). Several of the cafes that women frequent have also been recently upgraded in my city. This is nice for us ladies who like to go out and get a coffee with our other female friends! I appreciate all the changes that have come with the new government in power. I hope that with these changes Albania is better equipped to begin combating corruption and the post-communism mentality that leaves many people feeling hopeless for the future. Change is beginning to happen all around us and if we begin to make little changes in our own behavior and our own lives, then things will slower begin to develop under the surface. Changing the exterior is nice, but working towards a better interior is what is really going to help push this country in the right direction. 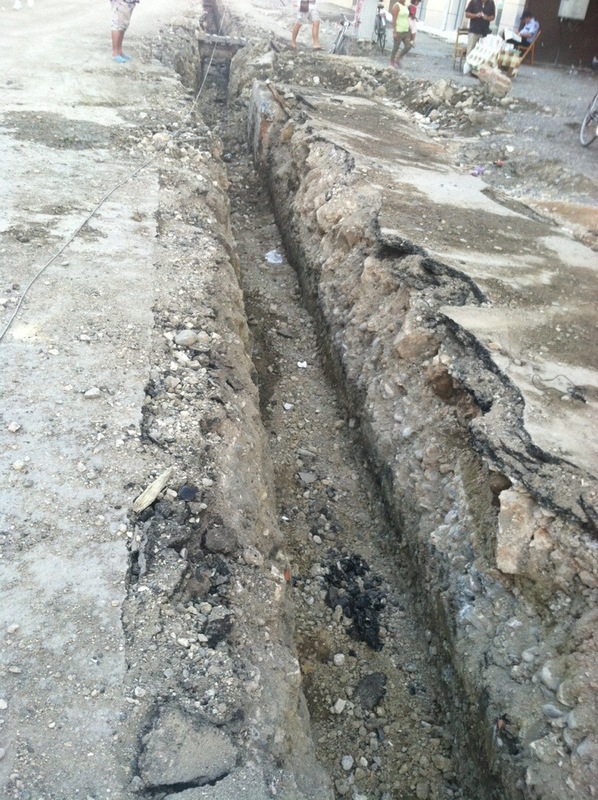 The first phase of tearing apart the road. Not exactly the safest area to be walking around in. My neighbors decided to only paint a portion of our apartment complex to give it that “new home” atmosphere.